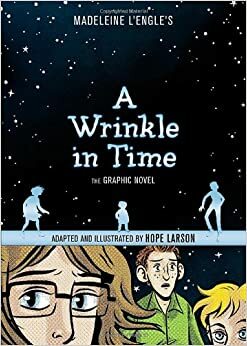 A Wrinkle in Time was an interesting graphic novel read for me because I loved the original full text when I read it years ago. It was fun re-reading with pictures in front of me, particularly because the magical elements were translated well. The distinct drawing style set apart the different worlds, and the various types of speech bubbles made the text understandable. The classic story of love conquering evil give the sci-fi/fantasy plotlines a heartwarming backbone. Meg’s issues with self-confidence, Charles Wallace’s caring exuberance, Calvin’s outsider attitude, and Mr. Murry’s quirky intelligence provide readers with a fully-developed sense of character and relatability for many bookish students. While some of the concepts are slightly sophisticated, the imaginations of our middle school students are strong, so I would recommend to 6th grade and up. A great option for kids who want to read the book before seeing the movie, but need a more paired down version than the original full text. Orange: The Complete Collection 1 is the first manga I’ve read, so it took a bit for me to get used to reading from right to left. Once I got the hang of it, I got sucked into the story. Naho is 16 and begins receiving letters from her 26-year-old self. What she originally thinks is a prank becomes too real when the letters from the future predict specific occurrences in her life. There’s a new student at school – Kakeru – who future Naho wants to protect. Present day Naho has to heed the warnings in the letters to save Kakeru from his future, but sometimes she gets in her own way. The book questions whether what happens in the past actually affects the future, or if there is a parallel universe where the past and present don’t eventually collide. Good for 6th grade and up. Paper Girls 1 starts innocently enough with a group of girls delivering newspapers in the ‘80s around Halloween time. Things quickly ramp up when they find a time/space machine, and zombies who aren’t actually dressed for the holiday start chasing them. Turns out the zombies are actually young people from the future travelling back in time to fight old people who also seem to be from the future. Somehow the chaos made me want to read on. The old people look more futuristic and seem to have bad intentions. Because the zombie teens and future old people both speak different made up languages, it’s a little hard to follow who is good and who is bad. Pair that with the trippy flashbacks and dream sequences, and I was left wondering what exactly happened. Solely out of confusion and an unresolved cliffhanger, the second volume is on my to-read list. Because of the language and complex story line, this might be better for high school students. This week’s graphic novel is The Underground Abductor by Nathan Hale, part of the Nathan Hale’s Hazardous Tales graphic novel series. Reading this graphic novel reminded me of why I enjoy narrative nonfiction so much; you learn a ton about history without it being painful or boring. The Underground Abductor tells the story of Harriet Tubman, who of course I already knew something about. But I learned so much more of her story, particularly her family life and childhood, from reading this book. For example, I didn’t know that she grew up on the Eastern shore of Maryland, and that much of her family remained there until she rescued them later in her life. If you are interested at all in the Underground Railroad, or if you are looking for a stranger than fiction true story, give this one a try. It’s good for grades 6 and up. So first off, mea culpa. I’ve been a slacker and missed graphic novel Thursday for – oh – about two months. It’s been a little busy around the Severn Library, what with genrefying the fiction collection and lots of good projects going on. To make up for my absence, this week I will review THREE (yes THREE) graphic novels that I’ve read while I’ve been gone. First, let me say that I really enjoy nonfiction in graphic novel form, especially memoirs. (Hello Persepolis, Relish, Sisters, My Friend Dahmer, Maus… ) This was no exception. In Tomboy, Liz Prince tells her story about not fitting into society’s idea of “girl” and how that shaped her childhood and teen years. It really resonated with me right now, as I’ve been doing a lot of reading and thinking about what gender even means and how society pressures people (especially kids) to follow certain arbitrary standards of gender. It’s a novel with a lot of heart, and I’d recommend it to anyone 9th grade and up. This book was just pure fun. An alien boy, who can’t remember who he is or where he came from, crash lands on earth and is found by kid named D.J. and hilarity/adventure ensues. D.J. is a pretty lonely kid, although his one good friend, Gina, has recently moved back to town. When Gina starts asking questions about the strange new boy hanging out with D.J., she gets pulled into the adventure as well. Funny, with some great action sequences, pick this up if you are in grade 6+. Thomasina lost both her parents in a tragic car accident when she was five, and ever since then she’s been waiting for something good, maybe even magical, to happen in her life. But it never has. Now that she’s sixteen, she’s accepted that her life will never be remarkable, but that all changes when she wakes up one morning to find her pet snake, Sebastian, missing and her foster family nowhere to be found… at least not in human form. This story is a mixture of serious issues and fun, magical elements and completely human emotions, and is recommended for grade 6 and up. Welcome to week four of Graphic Novel October! 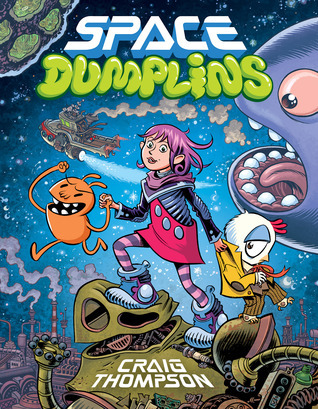 This week, I’m reviewing the humorous, sometimes silly, yet deceptively complex, Space Dumplins. 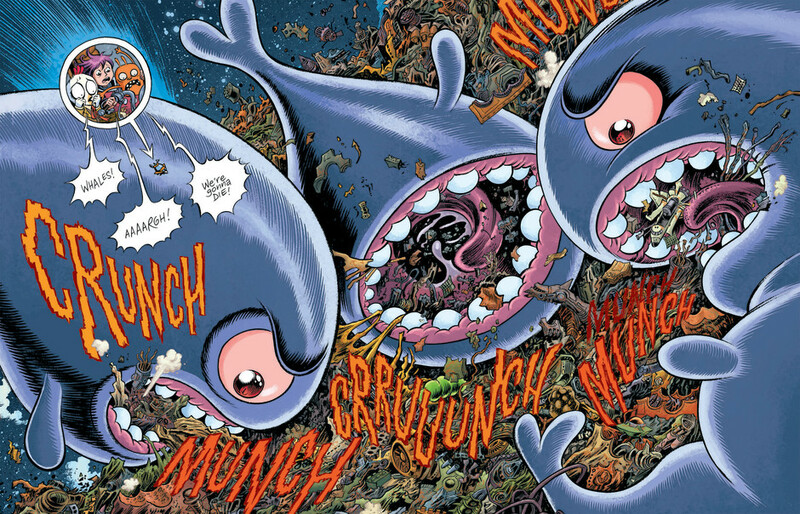 It’s the story of planet eating whales, a lot of poo, and a highly intellectual chicken. It’s also the story of industrial corruption, second class citizenship, and one girl trying to save her father. Somehow, the same novel that revolves around an environmental disaster caused by whale poop in space also addresses universal experiences like social acceptance, family bonds, and justice. Go figure. Whether you want a read with some good laughs and truly epic bodily function humor, or a story of friendship, loyalty, and bravery, this book has you covered. I’d recommend it for middle school students and up.